Sermon for August 14, 2011 (Lect 20a). Scripture: Matthew 15:21-28, Isaiah 56:1. Sermon refers to the recent ONE Moms trip to Kenya. Moms are incredible people. When a mom is on a mission for the sake of her child, there is not much that will stop her. The best advice to those who would try is to get out of her way! Sarah Palin used the term “mama grizzlies” to describe the instinct of a mother grizzly bear to protect her cubs as something that is present in human moms, too. I suspect that even her political opponents would likely agree on that particular point. When a mom is driven by love for her child, she will go to incredible lengths and accomplish incredible things, even if she has to do it all by herself. This is what we hear in Matthew 15 as Jesus is approached by Cannanite woman and the story ends with Jesus proclaiming, “Woman, great is your faith!” It’s the only time in the entire gospel of Matthew that anyone’s faith is described as “great,” and it comes a few paragraphs after Jesus call Peter “you of little faith” as he tried to walk on water and began to sink. This Canaanite woman makes a pretty quick entrance and exit in the bigger story of the gospel and the story of Jesus, but in this single encounter Jesus recognizes and celebrates her great faith. Imagine the deep sadness–the constant hurt–of a mother watching her child suffer, feeling powerless to offer any help. Day after day she watches her daughter suffer as she looks for any possible way to make it all stop. But when a mom is on a mission for the sake of her child, there is not much that will stop her. She has a brief but striking encounter with Jesus. At first it appears that Jesus isn’t going to help. It even appears that Jesus isn’t willing to help. But this mom was not about to back down. There is a lot to think about, pray about, and discuss in this story of Jesus and the Cannanite woman: Was Jesus really not willing to help her? Was Jesus testing the woman? Was Jesus showing the disciples that their own lack of concern was to be overcome as God’s new reality happened right in front of them? There is a lot in this very rich story for us to be changed by. Today, I invite you to consider the tenacity of this woman–this mom. Day by day she watched her child suffer, and instead of being driven to despair, she was driven to action. She couldn’t solve the problem on her own, but she was determined to be involved in the healing. When she encountered Jesus, she used the one thing she had the power to use: she used her voice, determined to see her child healed. It required that she speak up, even when surrounded by people who did not want to listen. It required that she be persistent: not in order to make her point or to win an argument, but in order to save her daughter’s life. And when a mom is on a mission for the sake of her child, there is not much that will stop her. As I listen to this story of a foreign mother begging for her child’s life with determination and tenacity, I think of the moms even in today’s world that face the same struggle. I was hoping for chance during my last few weeks at Temple Lutheran Church to draw our eyes once again to the work of the ONE Campaign. This week, the opportunity has presented itself in a beautiful way! It came in the form of a news story this past week: a story about a group of moms from across the country that were gathered together by ONE and traveled to Kenya to witness the reality of the famine happening there today. They went to visit with moms just like the Canaanite woman in Matthew 15. Moms around the world are watching their children suffer and die, and many of them, just like the Canaanite woman, are looking to Jesus. But here’s the thing: in the 21st century, we are the presence of Jesus in the world. Jesus places his ministry in our hands and sends us into all the world. And that begs the question, then: as followers of Jesus in the world today, are we going to stand by and let this crisis continue on our watch? We have the ability to end the suffering. The diseases are preventable and treatable; we have the medicine. It’s just a matter of having the determination to see it through. The programs that have been developed in the past 8 years are working. There are now 5 million people on the continent of Africa receiving the treatment they need to prevent HIV from killing them. If we see this through, by 2015 we can eliminate the risk of any child being born with HIV. I am proud that we continue to be a part of God’s response to this crisis. As Temple Lutheran Church, we have saved lives. People are alive today because of Temple Lutheran Church. We’ve sent bed nets to fight malaria. We’ve sent animals to fight poverty and hunger. In the past few weeks the ELCA has sent $400,000 in aid and Lutheran World Relief has sent nearly $500,000 to save lives from the famine in East Africa. As we continue to find ways to use our resources to provide help, we must also use our voice and our determination to see these children healed. We must speak up, even when surrounded by people who did not want to listen. We must be persistent: not in order to make a point or to win an argument, but in order to save the lives of millions of God’s children. We know that the world is facing challenging times. There is a financial crisis that effects every one of us. We must not, however, lose the tenacity needed to create the new reality that Jesus came to make possible. We must remain committed to the new reality that our faith invites us to create in the world. Like a mom on a mission for the sake of her child, we must stop at nothing. We must not be driven to despair; we must be driven to action. 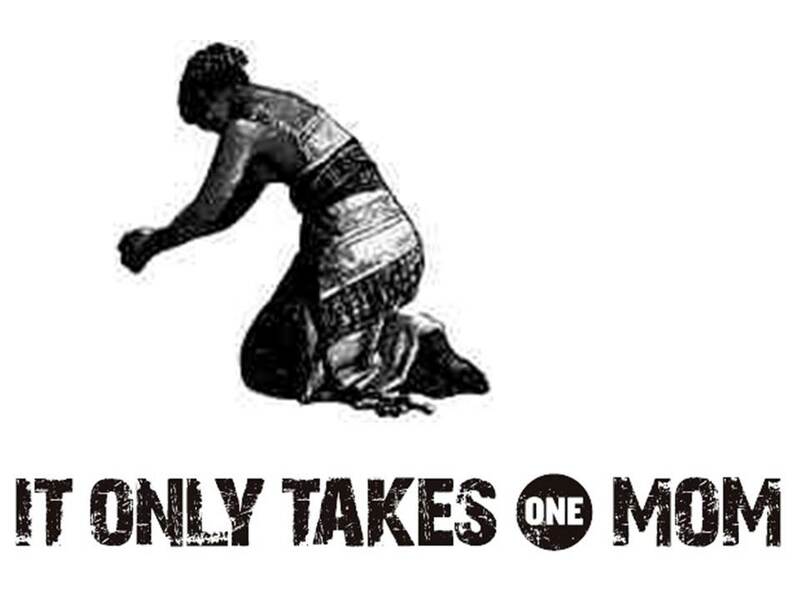 It only takes ONE mom. It only takes ONE voice to change the world and make healing possible. And as we add our voices together–moms, dads, women, men, old, young–we become ONE church serving ONE God to bring about ONE new reality for all the world. A new reality in which where someone lives doesn’t determine whether they live. A new reality in which blessing and healing are open to everyone. A new reality shaped by God’s love revealed in Jesus. A new reality shaped by what God is already doing here at Temple Lutheran Church. A new reality shaped by the good news of the gospel. Amen. ONE members Kristine Becker, Pastor Matt Staniz, Rev. Sunny Hallanan and Teri Ruiz with James Fitzpatrick (center), Senator Toomey's regional manager for SE Pennsylvania. I was excited to gather a team of ONE volunteers that I first met earlier this week at a ONE workshop to visit with the Philadelphia office of Senator Pat Toomey (R-PA). We were received warmly by the senator’s regional manager, James Fitzpatrick. I was also pleased to see that a picture of Senator Toomey with PA ONE members that I delivered was still on display in the office! Our conversation began with recognition that local volunteers signed up 2,851 new ONE members at the Philadelphia U2 concerton July 14 along with celebration of Bono’s announcement that there are now 5 million people receiving life-saving treatment for HIV/AIDS. During the meeting we talked about ONE’s priorities for the upcoming budget year: childhood vaccinations, ending mother-to-child transmission of HIV, and effective investments in agriculture. We discussed the amazing stories that are now being shared with the world through Living Proof (a partnership between ONE and the Bill and Melinda Gates Foundation). We recognized that Senator Toomey entered the Senate at a very exciting time in the world with regard to the effort to end extreme poverty and preventable disease. Our discussion centered around the less-than-one percent of the U.S. Budget that is saving millions of lives, helping people earn their way out of poverty, and providing important support to America’s national security through investment in development. As Senator Toomey continues to take a leadership role in America’s need to pass a budget that is shaped by responsible choices during a time of economic challenges, we were encouraged to hear that programs including PEPFAR (the Presidents Emergency Program for AIDS Relief), The Global Fund to Fight AIDS, Tuberculosis and Malaria, GAVI (the Global Alliance for Vaccinations and Immunizations), and investments in agriculture were viewed by the senator as both needed efforts and effective investments in the future that deserve to be funded according to the commitments that have already been promised. Thank you very much to Senator Toomey and his staff for taking time to continue America’s effective and compassionate work to help the world’s poorest people. Pastor Matt Staniz explaining the connection of faith and ONE advocacy. 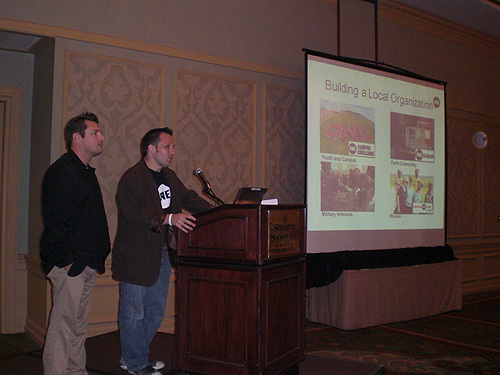 On July 16, I had the chance to lead a ONE workshop in Center City Philadelphia. The ONE members that came out were engaged and ready to turn compassion into action. 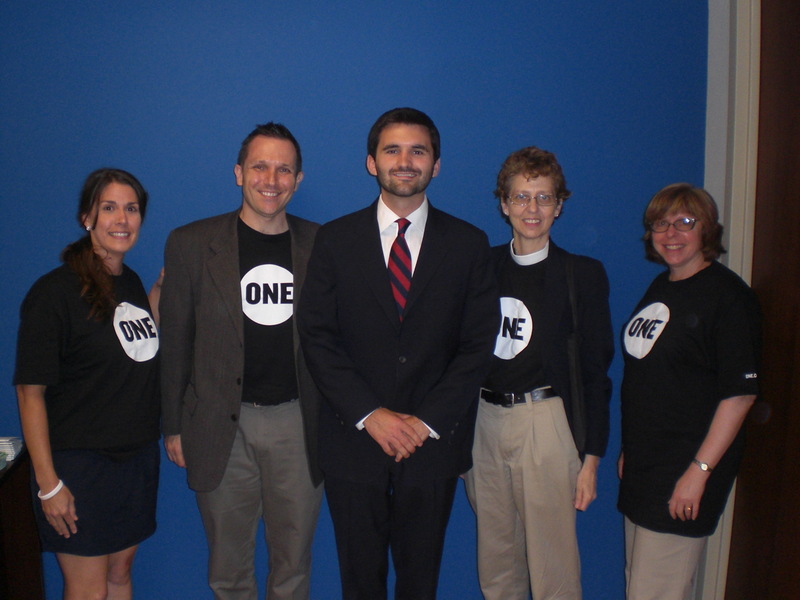 I was able to share my passion for faith-based advocacy for the world’s poorest people. I was excited (though not surprised) that most of the people that came out to get involved with ONE spoke openly about their participation in a faith community. This weekend I was fortunate enough to spend some time with an amazing group of ONE members from across the Tri-State area at a workshop in Philadelphia, Penn. As with the rest of the ONE advocacy workshops going on across the country, we enjoyed a a candid conversation about education, awareness and advocacy for ONE’s issues. I was extremely impressed with the group’s questions throughout the workshop. They became even more engaged after viewing some Living Proof clips. Everyone in attendance was very active in sharing ideas about how to recruit ONE members, influence others, make their voices heard and spread the word about global poverty and disease. This group was also very anxious to get involved and take action. Everyone in attendance wrote letters to their senators to tell them that with current funding, America has already saved 4 million people with life-saving AIDS treatments, vaccinated nearly 300 million children over the last 10 years against deadly diseases, and supported agricultural initiatives that help millions lift themselves out of poverty. We were able to do all of this for less than 1 percent of the federal budget. They also made sure to urge their senators to please continue to appropriate life-saving programs like the Global Fund, PEPFAR, GAVI and sustainable agriculture programs — and fight against any more cuts. This was a terrific workshop! I want to thank Pastor Matt Staniz of Temple Lutheran Church and Congressional District Leader Barb Barrar for their help and leadership throughout the workshop! ONE volunteers had an absolutely “beautiful day” on Thursday at the U2 show in Philadelphia. 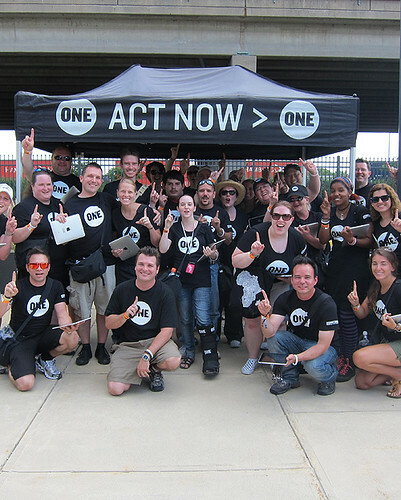 ONE members from around the Tri-State area converged on the Lincoln Financial Field grounds to share information about ONE and our fight against extreme poverty and preventable, treatable diseases in Africa. If you are interested in learning more about what is going on with ONE in the Philadelphia area, please visit the ONE Mid-Atlantic Facebook page. Lazarus Sunday was a stunning achievement, as over 1,800 congregations across the country signed up to partner with ONE to raise our voice together on behalf of the world’s most vulnerable people! Read the ONE recap of Lazarus Sunday, including an update on my event in Havertown!